Zion wins Best Brindle Dog in Show in the Scottish Great Dane Club Breed Champ Show for the second year in a row and also takes a first in a very strong Post Grad Class under UK Breed Specialist Mrs Samantha Dolby. 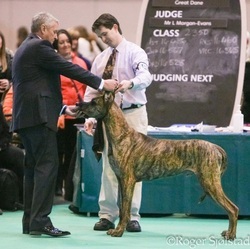 Zion won a Reserve Placing in his Post Grad Class of Crufts 2013 for the second year in a row (class of 14)! 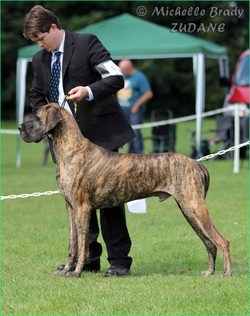 under UK Breed Specialist, Mr Laurence Morgan-Evans. 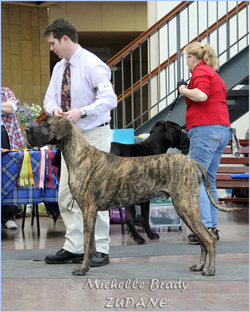 Zion & his littermates turned 3 on Feb 10th! At Virginia Agricultural Show, Cavan, 22 Aug!!! 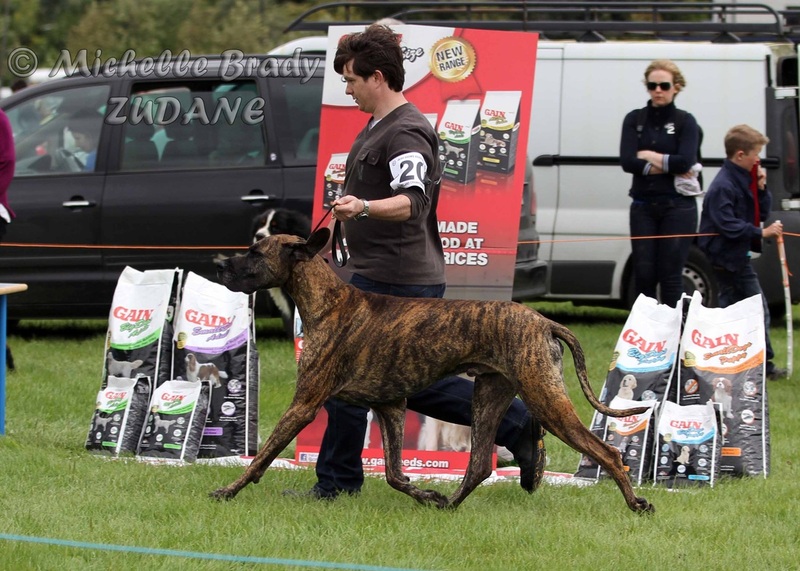 Zion also qualified for The Irish Shows Association's All-Ireland Championship Final (sponsored by Gain) in Sept.
SKC - Scottish Kennel Club 26 August 2012, Zion gets a very respectable 2nd in his Post Grad Class under Breed Specialist Mrs Heather Dyson (UK) coming 2nd to the RCC winner! 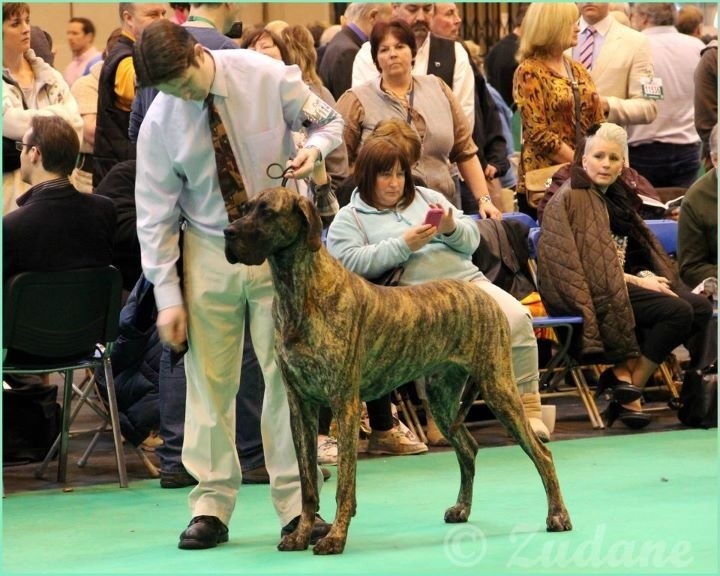 Although lightly shown in 2012, Zion has been consistantly very well placed in Championship Shows in both Ireland and the UK, which we're very proud of. 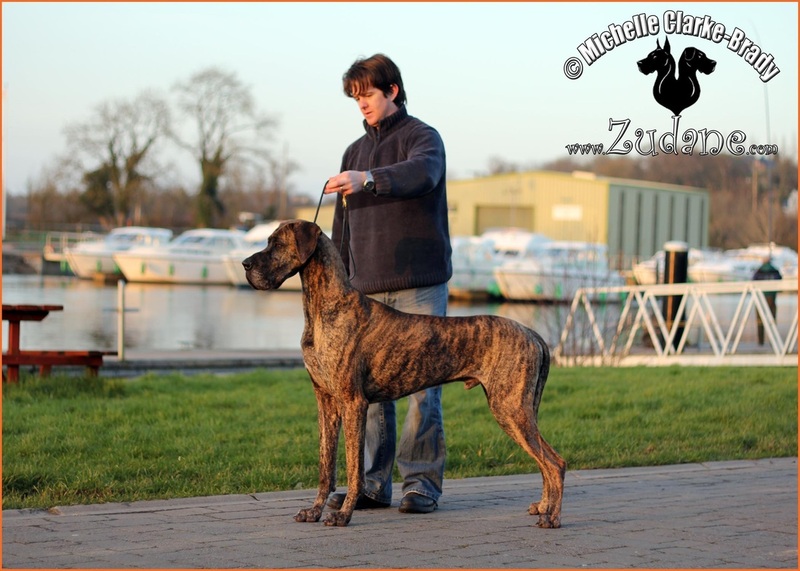 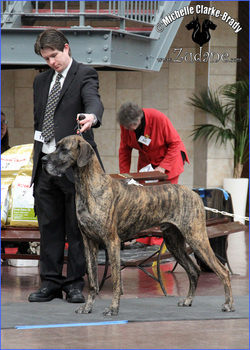 He got Res in a class of 11 and 3rd in Open Brindle in the Pennine Great Dane Club Ch Show in Darlington, England on 12 August 2012. 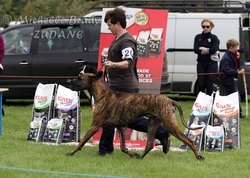 Zion gets 2nd in his class in SKC, Scotland. Very Proud of our Stripey Boy beating his UK Champion Dad Roucandane Seeing Stripes, to win Best Brindle Dog In Show in the Scottish Great Dane Club Championship Show under Breed Specialist Mr Rick Day (UK). This was a big win for Declan & Zion which took Declan quite by surprise!!!!! 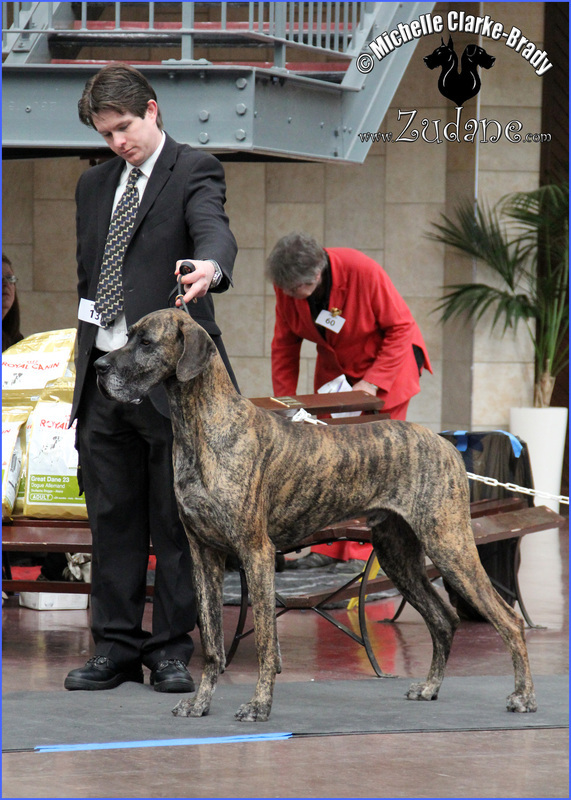 A lifelong ambition realised when Zion won the Reserve in his Mid Limit Class in CRUFTS 2012 under Breed Specialist Mrs Frances Krall (UK). We had dreamed about qualifying & showing in Crufts but to win a place was a dream come true! 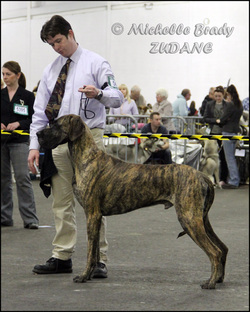 Following his BIS Judging appointment in Crufts 2012, Zion was judged by Mr Frank Kane (UK) in Our Club 'Dane Of The Year' Event where he was 3rd Best Brindle in Show. 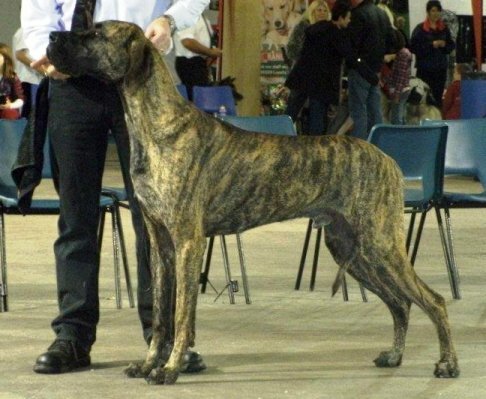 Zion, in the UK Champ Show held in Belfast achieved his UK Stud Book No & a Lifetime Qualification to CRUFTS with a 3rd in Limit Class at just 18 months old. 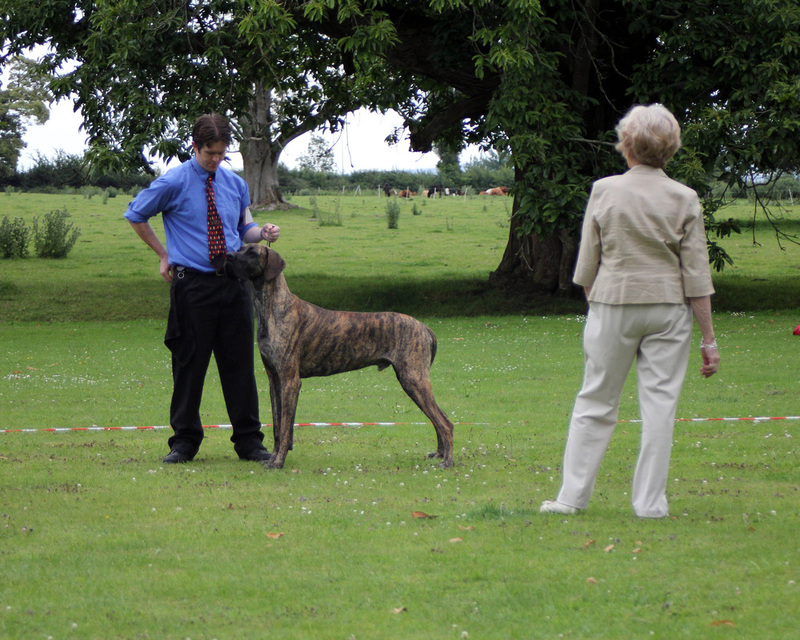 Zion wins his Intermediate Class in our Breed Club Champ Show under Breed Specialist Mrs Sue Cottrel (UK) & also Reserve Best Brindle In Show on the Day. 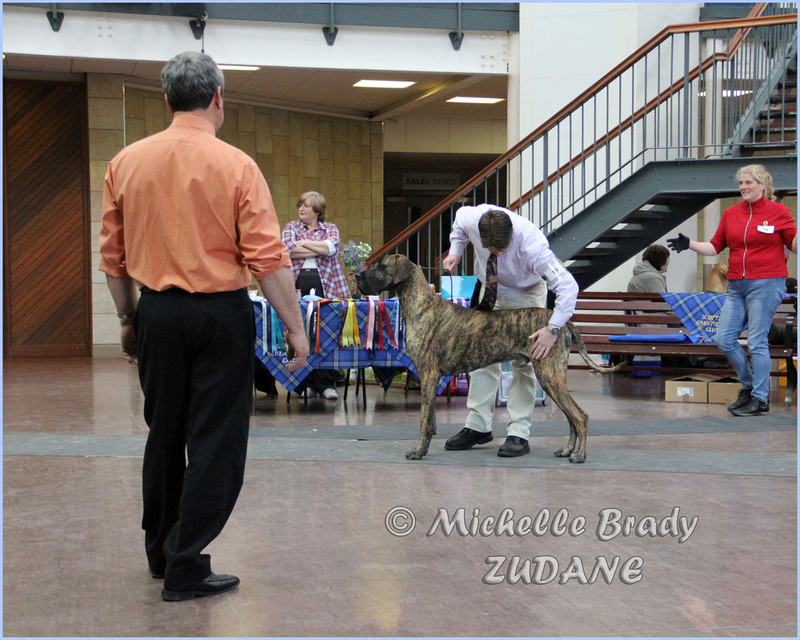 Zion wins 3rd in a very strong Junior Class qualifying him for CRUFTS 2011 & also 3rd Best Brindle in Show in The Scottish Great Dane Champ Show under Breed Specialist Mrs Janet Barkas (New Zealand).